Home → Clearomizers → Kanger T2 Review: Top Features, Ratings, Pros & Cons! Greetings to all you happy vapers out there…I see you’re thinking of investing in a brand new Clearomizer. Good thing I decided to do this review! I’m making it my business to help you make sure that you come home with a quality product that’s going to serve you well and make your vaping experience a stress free one. Over the past two days I had the pleasure of sampling Kanger’s T2, it’s the latest addition to their rather large range of eGo type Clearomizers we’ve been seeing on the market lately. By now we know that Kanger is a brand that we can most certainly count on to deliver the goods, especially when it comes to enjoying a rich and flavorfull vape. Not only is Kangertech known for it’s impressively huge range of quality vaping setups, their gear is normally also highly cross compatible and their prices are super-reasonable to say the least. In this review I’ll fully check out and pick apart this sweet looking addition to the Kanger family. Being an eGo style cartomizer it’s only going to be compatible with eGo style batteries, as well as some other’s like the 510. After filling up with one of my new favorite e-juices, Strawberry Cream Nog by Fuggin e-Juice for a full two afternoon sessions…I can happily award a very juicy 4 Star Rating on this Kanger T2 Clearomizer Review. So, the T2 is a very neat and tidy, sleek looking Clearomizer with a fully replaceable top coil. Overall, I got a flavorful and satisfying, rich vape, although this is most certainly not big time cloud chasing material…the airflow was nice and easy and it didn’t get overly hot with my extended use, which is a good sign. It’s a great, budget option with excellent value for money, very acceptable. That said, I saw no reason to give it less than a 4 star rating in this Kanger T2 Review. Looks: A straight-laced, quality build, with measurement markings on the 2.4ml strong plastic Clearomizer, which is available in clear, blue or red variations. The components are no problem to disassemble and it comes with a combo cap and lengthy black plastic drip tip (sadly, not interchangeable) all neatly screwed into a steel base. 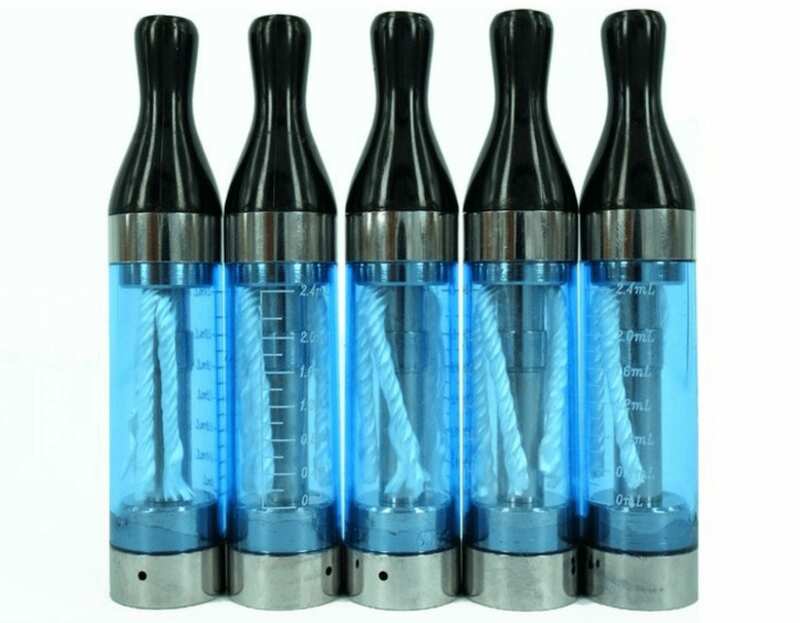 Refill: The shape of the clearomizer, with the shaft which extends out of the tank, makes refill extra easy, with little or no spillage into the central tube. The snug fit of the clearomizer into the mouth piece means that it’s unlikely you'll get any leakage onto the mouthpiece. The top coil design of the Clearomizer means that you’ll need to keep your e-juice at a nice, high level so that it can properly soak into the coils. Compatibility: Below the Cartomizer you’ll see the textured covering where the eGo threading is, there are also a couple of ventilation holes on the skirt. The grip obviously makes screwing in and out a whole lot simpler. One thing that’s useful is the fact that this Clearomizer is compatible with your 510 adapters and then also, obviously, the eGo style batteries. Quality of Vape: I found the airflow to be pretty impressive, especially with the sturdy feel and fit of the upper components. There are holes drilled into the base where you can easily control airflow with your finger. Long, thick wicks in the Clearomizer make for a full clean flavor hit (provided you’re using a good quality e-liquid), I was actually pretty impressed with the full vapor production. No problems with the performance during this T2 Clearomizer review. I may have been taking it easy on the tank this time but I didn’t notice it getting overly hot, just a rich, warm hit. I’ve no doubt though that the piece may get really hot if you’re rough on it, especially since the coil section is so large and high up. A Quiet Vape: I was surprised at the silence of the piece…I usually end up with a bit of a hiss or bubble no matter what device I’m using but after 2 days it was still perfectly quiet. At the end of the day, I felt that the vape and flavor quality was more than satisfactory. The Drip Tip: The T2 comes with a black plastic drip tip which is not necessarily everyones cup of tea as they do have a tendency to show scratches later on. However, I personally found that the mouthpiece was comfortable and minimized dripping. An unfortunate drawback of this design is that it’s not interchangeable with other mouthpieces. Coil Height: The only possible problem I could see with the top coil system and wicks which site very high up in the tank is that, if you don’t make sure to keep your tank full, almost to the top, those wicks might not get enough juice and you’ll need to hold the piece at a very steep angle in order to get a decent hit. Other than the small factor of the tip and coil height , I really couldn’t find fault with the T2 Clearomizer System, not a lot of cons. Absolutely, Quality, Performance and Range: At a great price of $19.99 with no less than five clearomizer replacements. Kanger has once again delivered a well manufactured product which really does the trick. Awesome, super quiet performance and Kanger always has a really good range to chose from, to suit any budget. What can I say? It was a pleasure to spend the weekend catching delicious strawberry flavored clouds with the T2 Clearomizer System. I’m pleased to say that although this isn’t what you’d call a heavy duty system, it’s without a doubt a high quality option with excellent performance that doesn’t seem to have many cons. I’d opt for this baby as a ‘standard night out’ Clearomizer or as a good choice for a beginner to medium level vaper. To learn a little more about looking after and cleaning this piece, check out this handy video tutorial. It’s sturdy, snug and well made, no leakage, hardly any noise and overall an extremely pleasant vaping experience for me. Until we vape again…enjoy.